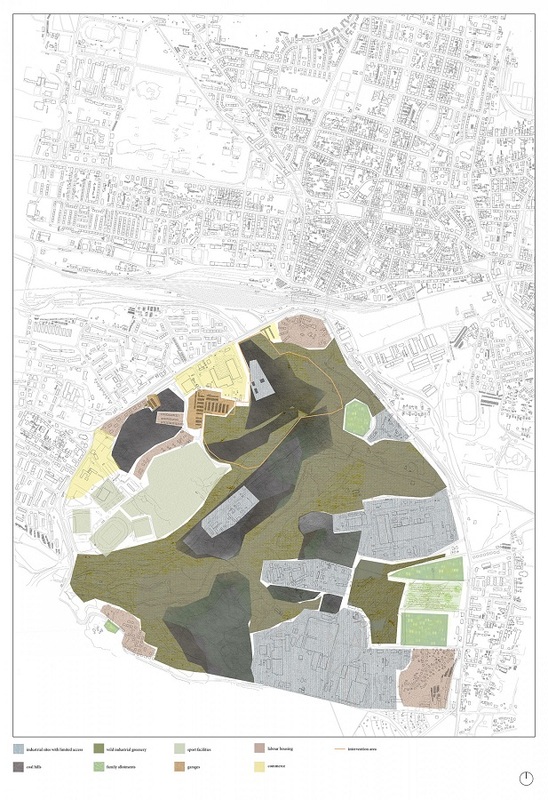 The project presents a strategic proposal for an urban transformation of the economy and the landscape after closure of the mines. The case study focuses on Bytom, one of the most problematic cities of Upper Silesia socially and economically and now in a physical state of chaos. 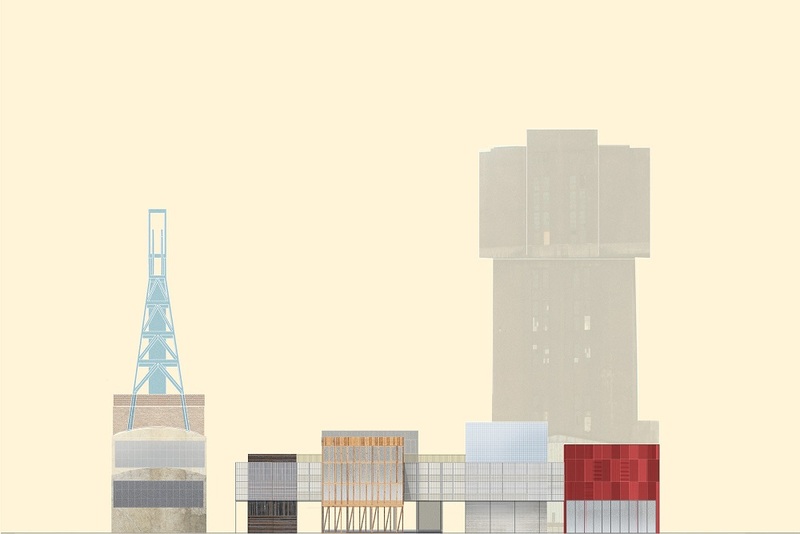 I didn’t hesitate much with the decision on the topic of my project at Design as Politics studio ‘Let’s work – Architecture, Industry and the City’. My dad comes from Upper Silesian area, former coal mining empire of Poland, facing nowadays economical shift due to the crisis of the local industry. Visiting the area very often, I witnessed the fall of the coal industry and its social and spatial impact. My main sources of inspirations are authentic grassroots spatial interventions of so-called normal people. I like to say that I ‘hate’ design even though I am a designer. I prefer to look for wisdom and beauty in vernacular and informal activities. I like allotment gardens, flea markets and weird building extensions. Recently, I am also very inspired by inhabitants’ interventions in shared spaces of social housing settlements in the Netherlands. One of the site visits turned out to be a breakthrough in my research and design process. It was a rainy afternoon when I was again spying in the wastelands of the industrial mega-site around the former Szombierki mine. I was already asking the guards many times before to let me into the mine shaft buildings but never succeeded. However, that afternoon, it started to rain really hard and they agreed to let me in to wait until it clears up. That encounter opened a new spectrum of inspiration and ideas for me, especially a long discussion with Stefan – former minor and current guard of the shaft. He showed me his little botanical garden in the building – as there is not much work on the mine anymore, he has time to cultivate his hobby. Upper Silesia in southern Poland is a former industrial landscape and was once a prosperous area. The coal mines had been a major source not only of employment but also of friendship and shared memories. With their decline, the community as a whole lost its identity, putting it in need of new models of labour and living. 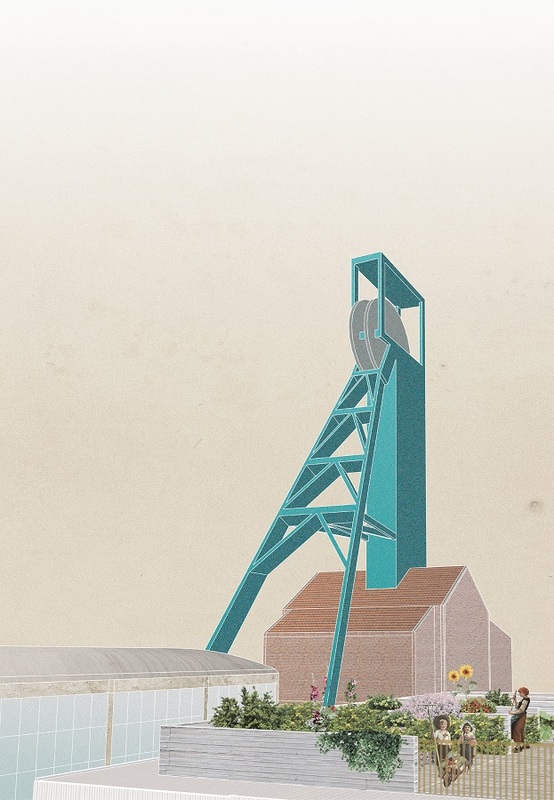 Most of the former miners felt at odds with the post-industrial landscape and mood. The project raises the ‘post’ aspect for discussion. To emerge from the current impasse will require reinterpreting the traditions and roots of the community and from that position develop new, contemporary urban systems rooted in the ambience of the past. 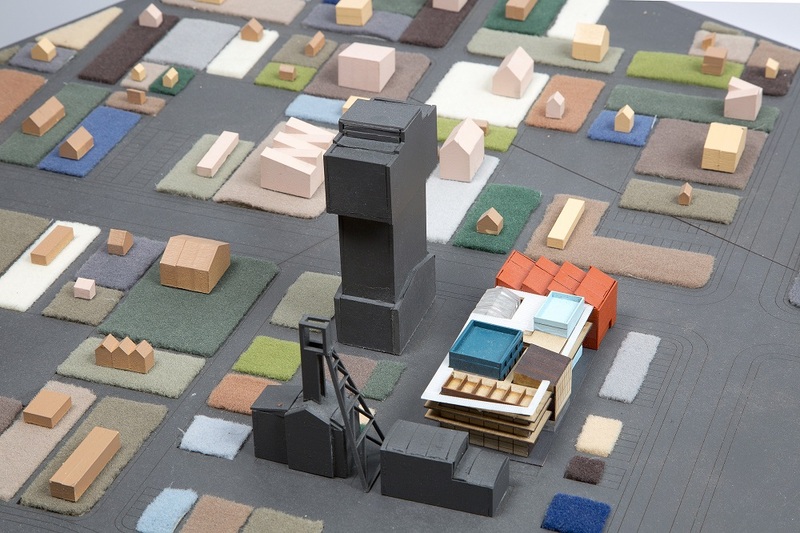 The study examines the idea of re-interpretation based on rebuilding the work ethos, building type, construction materials, energy, landscape and, accordingly, the community. The romance of the Silesian landscape and the revival of the allotment together create a new urban value based on nostalgia. The starting point in the phased master plan is the construction of a community centre. Projected at the centre of the planning area, it is a starting point in spatial terms too. It abuts the buildings of a former mine, which means it can also be a conceptional starting point by designing it as a manual at 1:1 scale for building with reused materials. 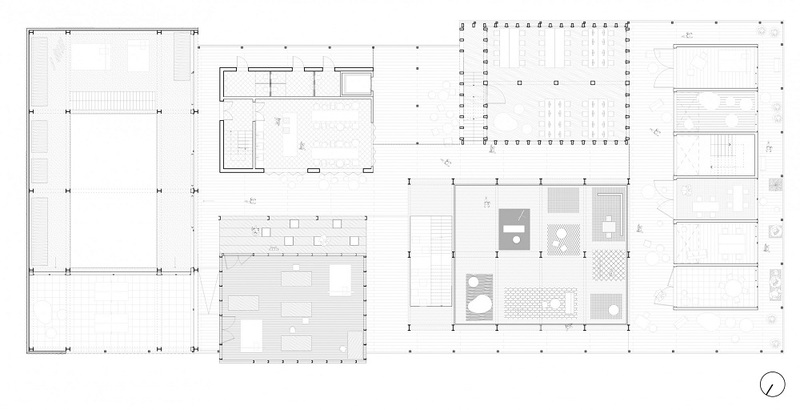 The programme is to provide users with a flexible, multifunctional space for an experimental building laboratory. This can include a market for scrap materials, an industrial workshop, small studios and offices, a communal canteen, a council information unit and rooftop allotments. Reinterpretations of local typologies such as industrial sheds, glasshouses, lean-to roofs or a row of garages act as a varied and adaptable framework for a whole range of functions. A valuable interstitial space ties these functions together. By making use of internal routes and border zones between functions, the notion of allotting is represented as the model for a spatial order much like that seen in allotment complexes. The next stage of the project would be to gradually implement the allotment model for the new live-work community. There are general rules to be followed that relate to roads, paths, infrastructure of technical installations and maximum surface areas of plots and buildings. On the other hand, users get plenty of freedom in deciding what form their settlement should take. A condition when renting a cheap residential plot is that the renter registers a business activity so that a new community can emerge, one that combines living and working. This planning strategy will in turn mobilize the local economy. After graduating, I’ve been already living in Rotterdam and Brussels. At the moment I am finalizing my research project Social Housings, funded by Stimuleringsfonds Creative Fund NL and planning to move to Warsaw to work on my own research and design projects. In June I am going to participate in ‘On Cities’ workshop in Madrid as a scholar of Norman Foster Foundation. I would like to achieve a certain independence in my design choices even though I am still very young. I want to collaborate with open-minded people of various specializations and level of experience with help of supporting and conscious institutions or investors on bigger or smaller projects. Luckily, it’s already happening.